Our full-season sponsorship wall is returning once again this year, and we’re looking for kind donors to help fill it. 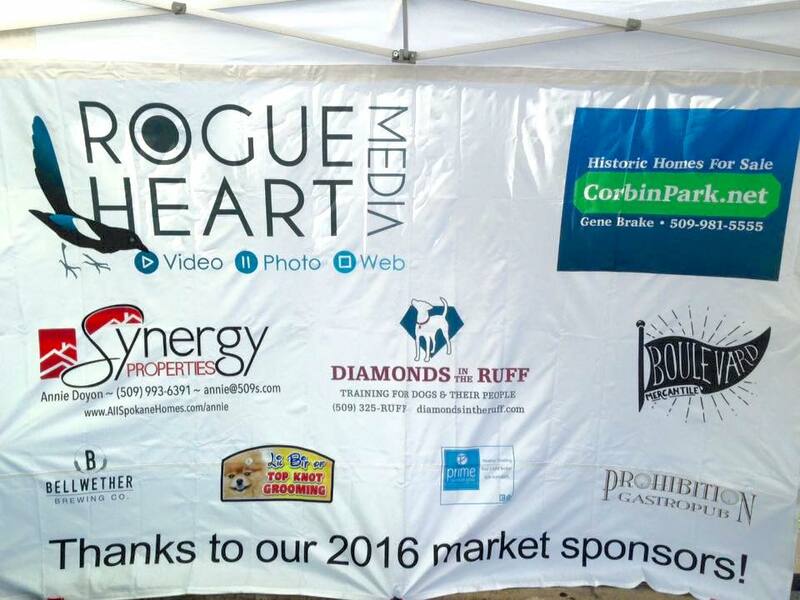 This highly visible 10’x10′ banner hangs at the back of the central market canopy for the entire season, making it a great spot to highlight your business or organization (for a really affordable price, too) while supporting our neighborhood’s grassroots, all-volunteer market. Tier 1: Blue ribbon – For $200, your logo shares eye-catching top billing on the sponsor wall. You can also supply us with plenty of take-home literature (e.g., business cards, flyers, brochures), which will remain on display at the booth’s info table throughout the season. Two spots available. All gone. Thanks to Gene Brake of eXp Realty and Spokane City Credit Union! 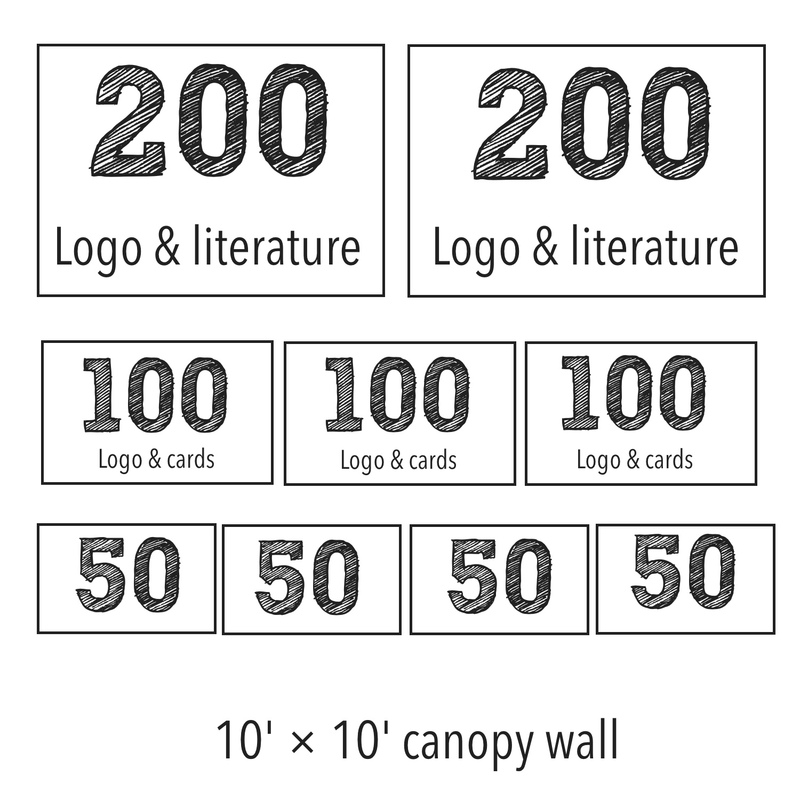 Tier 2: Grower– For just $100, your logo gets a central full-season spot on the sponsor wall. Not quite as large as the ones above, not quite as modest as the ones below. Plus your business cards will be displayed on the info table. Three spots available. All gone. Thanks to the North Monroe Business District, Mission CPA and Diamonds in the Ruff! Tier 3: Sower – For a mere $50, your logo will be displayed on the sponsor wall all season long at a size that says, “Grandiosity isn’t our thing, but you definitely should still check us out.” Four spots available. All gone. Thanks to 1889 Salvage Co., Kelly Cruz, Spokane Edible Tree Project and New Destiny Tabernacle! This year, we’re also holding one-day sponsorships again. For a $250 donation, your business or organization will have the chance to “take over” the market on a date of your choice through branding, activities and outreach. This gives you a really great opportunity to connect face-to-face with potential clients or customers while taking advantage of our existing event framework with its own built-in draw. Signage and banners provided by your organization and displayed across the market on the day of the event. Flyers or door hangers promoting your organization’s day at the Emerson-Garfield Farmers’ Market, provided by you and distributed door to door with help from market volunteers. Booking entertainment of your choice. This could be an employee with his or her own band or even something out of the ordinary, such as a magician or an Elvis impersonator to generate buzz. A central outreach booth on the day of the event where you distribute print materials and promotional items — for example, discount coupons or branded tchotchkes. A donation/fundraising drive or similar to add to the impact of the event. Plugging into our cooking/gardening demos or our weekly popular KERNEL kids activity to create a theme or build excitement about the event. All donations are used to cover essential market operational expenses, such as funding our weekly KERNEL kids activity, paying the market musicians, or our service fees for our point-of-sale devices. Donations are tax- deductible through our 501(c)3 partner organization, the North Monroe Business District. No matter what kind of sponsorship you choose for your organization, you’ll also get plenty of shout-outs on our social media (Facebook, Instagram, Twitter) throughout the season too. So if you’re interested in supporting our grassroots market and benefitting from the promotion through one of these affordable sponsorship tiers, please send us an e-mail or give us a call at 255-3072.